This is what I've been making for lunch lately. My five-minute lunch. Literally. It's also a great, quick dinner. I thought it would make sense to share it, in part, because it's ridiculous how often I make it. Or some slight riff on it. It's a quesadilla - sort of. I don't really like all-cheese, white tortilla quesadillas, so this is my take. 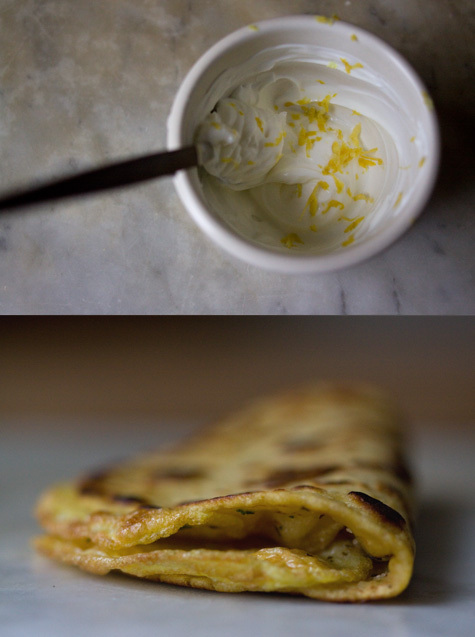 Corn tortilla - unda style, a bit of cheese, fresh herbs, and a dollop lemon-zested greek yogurt or creme fraiche. The egg helps make it more substantial and extra good. It's occurring to me that you might not know what unda-style means. I didn't until a couple years back. But there's a kati roll place nearby that makes kati rolls "unda-style" - which means, for an extra dollar, they throw a beaten egg down on the grill and top it with buttery-flaky roti bread. It sets, they fill and roll it. We joke around the house that I make everything unda-style now - crepes, quesadillas, anything flat and round. The best part about this style of quesadilla is that you can skip the cheese-fest. A little cheese? Great. But I'm guessing a number of you will agree with me - lots of quesadillas are just overkill in that regard. Instead, I try to work in a bit of creaminess through something like the yogurt. Or a smear of avocado. I made another version last week with a handful of smashed beans, avocado, a bit of grated cheddar, and roasted tomato salsa. But I like this version in particular, the crunchy, toasty capers and cream are nice, and a tad bit unexpected. This recipe makes a single quesadilla, feel free to scale it depending on how many you'd like to make. Whisk the lemon zest, yogurt, and a pinch of salt together in a small bowl. Set aside. 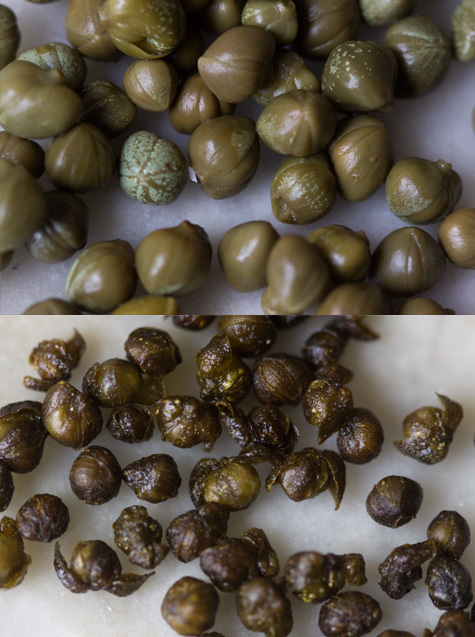 Now, take the capers, rinse them, pat them dry with a paper towel, and pan fry them over medium-high heat in a small splash of oil until browned and crinkly. Remove from pan and set aside. The should get a bit crunchy as they cool. Beat the egg and a pinch of salt in a small bowl. Beat the egg really well, so it's uniform in color. In your smallest skillet, over medium heat, add a tiny splash of oil. Let it heat, then add the egg to the pan let it set for just 10-15 seconds. Place the corn tortilla on top of the egg, the top of the egg should still be a bit runny, so it should attach itself to the tortilla as it sets. When you feel like the egg has set enough not to run, flip everything. Sprinkle with Parmesan, and some of the fresh herbs if you like. Cook until the cheese is melted and the tortilla is nicely browned. Fold the tortilla in half, top with the yogurt, the capers and more herbs.